PUTRAJAYA: Investigators have concluded that the Malaysia Airlines flight MH370 was manually diverted from its filed flight route, although it could not be ascertained who was responsible for the diversion. This is the finding of the Malaysian ICAO (International Civil Aviation Organization) Annex 13 Safety Investigation Team for MH370, led by Datuk Kok Soo Chon, which released the long-awaited Safety Investigation Report yesterday. Kok noted this is not the final report on the investigation, contrary to the perception of many. At a media conference yesterday, Kok said the team’s conclusion is MH370 had deviated from its path, and this was more than a result of system anomalies, but that the turnback was made under manual control. “Flight simulator trials established that the turnback was made while the aircraft was under manual control and not using autopilot,” he said. 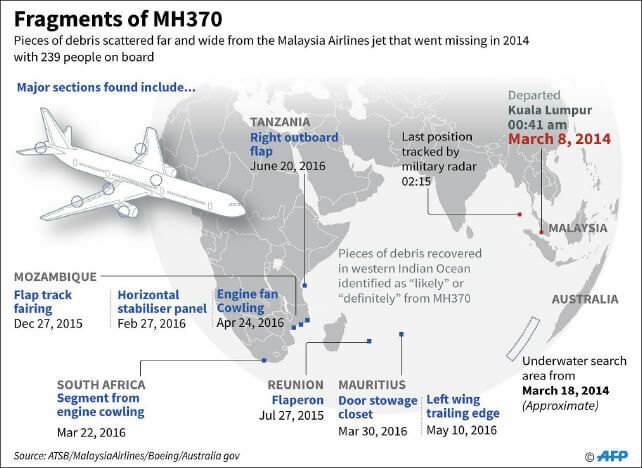 The 1,500-page report by the investigating team comprising 19 experts from seven countries including the US, Australia and China reveals the aircraft was well-maintained and had no malfunction or defect that could have contributed to its disappearance. It noted the lack of contact before the turnback could indicate that systems were being manually turned off whether intentionally or otherwise. Kok said the investigators examined the history of the pilot and the first officer, and they were satisfied with their backgrounds, training and mental health, noting they were well rested and not under financial stress, and showed no evidence of any anxiety or stress. However, the investigators are not ruling out any possibility since the turnback was done manually and the systems in the plane were also manually turned off. “I’m not ruling out anything, but there were two psychiatrists in my team and they were responsible for examining the audio recordings of the pilot and they concluded there was no anxiety and no stress in the recordings. It was just normal,” Kok said. “We cannot exclude that there was an unlawful interference by a third party,” he added, addressing the possibility of a hostile intrusion, although nobody has made any claims. Kok said it should be recognised that there is a significant lack of evidence available to the team to determine with any certainty the reasons that the aircraft diverted from its filed flight plan route. “In conclusion, the team is unable to determine the real cause for the disappearance of MH370. The answer can only be conclusive if the wreckage is found ... as far as our team is concerned, our work is done, we have released the report,” he said. AFP reported that relatives who were briefed before the report’s public release expressed anger that there was nothing new in the document, with some storming out of the briefing as frustration boiled over. She said the meeting between relatives and officials descended into a “shouting match” as anger mounted. G Subramaniam, who lost a son on the flight, added that “unsatisfactory responses left many angry”. To date, the main wreckage of MH370 is still not found. However, three pieces of debris have been confirmed to be from MH370. Some of the debris have been found as far north as the eastern coast of Tanzania and far south as the eastern coast of South Africa. In a separate statement, Transport Minister Anthony Loke said the ministry will review the safety recommendations proposed in the report and will take appropriate improvement measures to prevent similar future air accidents. At the same time, the ministry will also conduct a thorough investigation and take action against any misconduct committed based on the findings under the existing provisions of the law. “The issuance of this report is a testament of Malaysia’s commitment and transparency in complying with its obligations as one of the contracting states under the Annex 13 of ICAO. “The [investigative] team has been given full freedom in conducting the investigation and not a single edit or amendment has been made to the report,” he said.